Prehistoric sites come in all shapes and sizes, and are found in just about every conceivable type of location. It is often easy to overlook the fact that the world our neolithic or bronze age ancestors inhabited has been changed beyond all recognition, partly by natural forces, but mainly by our more recent ancestors and our current endeavours. A stone age man or woman deciding where to build their home or cairn or circle could scarcely conceive of the degree to which their species would prove so remarkably successful: if success can really be measured in the strictly limited sense of producing more and more of the species. Because of this, prehistoric sites sometimes turn up in what seem to be really odd places. And when you find one that is, the natural tendency is to look around and wonder why on earth someone picked this spot rather than any of the others they might have picked. It is only too easy to overlook the fact that something like a neolithic cairn, which may date back 4500 years, is the oldest thing in the landscape: older than any other evidence of mankind's activities; older than the fields and the trees; often even older than the line of the coast or other elements of the topography such as the courses of rivers. 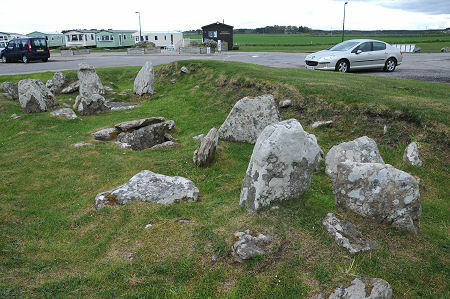 So it really shouldn't come as such a surprise to stumble across Embo Cairn, surrounded by a holiday park on the east coast of Sutherland two miles north east of Dornoch. 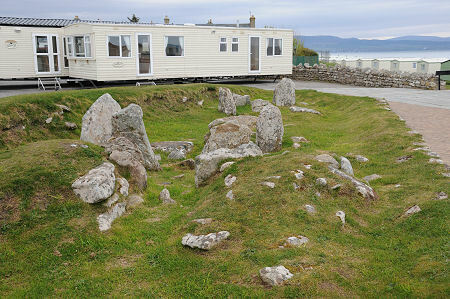 The cairn occupies a grassy area near the reception and car park and there are static caravans to the north and east. 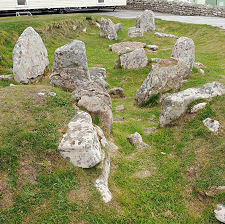 This was all open links land when the cairn was first excavated in 1956. Proposals were subsequently made to use the area occupied by the cairn as a car park and in 1960 a full rescue excavation was carried out with the aim of completely uncovering the cairn. This was done, and the cairn proved so interesting the decision was taken to leave it in place and develop the holiday park around it. As a result the cairn elements remain on view today, though the soft sandstone of the upright stones or orthostats has eroded over the decades since they were exposed. Most of the corbelled roof of the cairn had been destroyed at a much earlier date, with the result that what you see today is the lower part of the structure. Embo Cairn was originally built in the neolithic era some 4,500 years ago and had two chambers. 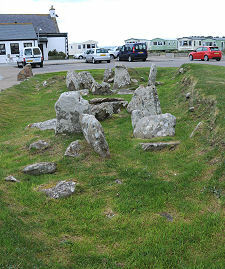 One contained the remains of at least six adults and nine children, while the second chamber had been badly disturbed at some point and contained what seemed to be a midden deposit that held the bones of many types of animal, including the Great Auk, now extinct and unlikely to have lived in mainland Scotland for many centuries. 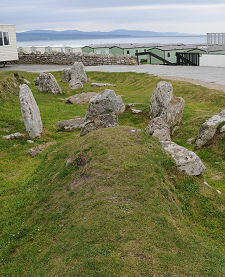 It then seems that the neolithic cairn was reused over a thousand years later when our bronze age ancestors placed two burial kists within the structure. 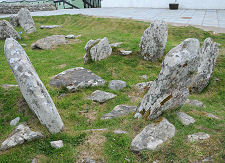 One of these can still be seen in the centre of the cairn and was used to bury two babies. The other had been used to bury a woman who was accompanied by a necklace of black jet beads and a food vessel.